Before 2011 a movie starring Johnny Depp being directed by Gore Verbinski would mean only one thing; there is a new Pirates of the Caribbean in town. Ironically there is, 'On Stranger Tides' hitting cinema screens a couple of months after animated adventure 'Rango,' however this is 2011, and the Depp-Verbinski team has moved on from the Caribbean to the West of America to create one of the most unique animated movies to exit the Hollywood conveyor belt in many a year. The first thing that can be said is that this may be animation, but it isn't just for the kids. In fact, I would go so far as to say that any children under the ages of six may struggle to invest themselves into the mature story-line and could find themselves a little frightened; the creatures are at times repulsive, the plot at times dark as night. 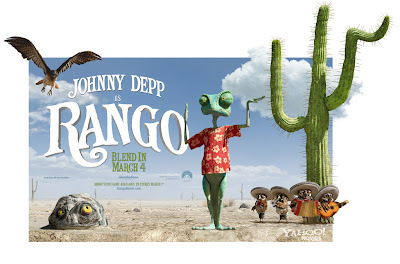 This is a Johnny Depp movie after-all, and it would only make sense that he would lend his exceptional talents to something a bit out of the ordinary... and Rango is certainly not. With an opening that feels slightly flat and confusing, and with a few jokes which fail to meet their mark, the beginning of the movie paves the way for a movie which when it gets it right is perhaps hard to better, but when it gets it wrong slaps the audience member in the face with a huge wave of mediocracy. I can't help but feel that the opening will have alienated more than it delighted as it was too surreal and daring for a moment which should have been safer and real. I'm all for the surreal but save it for a little later into the running time; I needed to invest into the leading character and instead found myself a little out of the loop and uninterested. Regardless of this, once we've finally got to know the leading character, and his quest begins after a strange meeting with 'Roadkill,' (an armadillo who appearance is as his name suggests quite eerie) then a daring and spectacular escape from a hawk on the prowl for food sets in motion an action packed and daring middle third. This is where 'Rango' truly finds its feet and from here on in it picked up a head of steam it only slightly drops a couple of times afterwards. As characters begin to show themselves such as Isla Fisher's Beans and Ned Beatty's Mayor, the laughs start hitting their mark and the storyline definitely improves; as a result of this Depp's Rango becomes a great hero who tries to save the town of Dirt from the various attacks and drought that has befallen the West. As the set pieces build up and mysterious encounters with 'The Spirit of the West' happen, you begin to find a respect for what Verbinski was trying to achieve and you have to salute the fact that with Depp as his leading man he has come closest to creating a kids animation/adult drama than anyone ever has before. Whether that's because no-one else has tried so hard to do such a thing remains to be seen, and whether it actually works is one that is very difficult to judge but the general consensus of others suggest that Verbinski has managed to just about make it work. Visually though, Rango truly excels; it is a gorgeous work of animation from the details in the backdrop of the West to every bizarre speck on every one of Dirt's population. It just is spellbinding to see and visualise and it is this aspect that makes the movie a true gem. At times you sometimes wonder whether subconsciously you could be watching an animated interpretation of a live-action movie script; the difference being that Verbinski's desire to use creatures rather than humans the deciding factor in why Rango is all computer generated imagery rather than actors in front of cameras. At the end of the day, when the sun has set on Rango, for all it's flaws it is without a doubt the most daring and bold animation this century, it features a fantastic display of talent behind the scenes who have created a world that is awe-inspiring and in Depp and the many other talents who lend their voices to the show it has a bunch of characters who deserve to be remembered as great creations of cinema. It is for those reasons that even though I still struggle to really know if I loved 'Rango', I have to recommend it as something that demands your attention and your time.